Bank Street Toyota offers you a complete inventory of high-quality genuine Toyota parts and accessories for every model - and every need. At Bank Street Toyota, improving the versatility or style of your Toyota has never been easier. Our team of consultants will help you find the perfect genuine Toyota part and accessory from Toyota’s extensive parts and accessories catalog. Toyota genuine parts and accessories were designed to fit perfectly with your Toyota and engineered to preserve the safety and functionality of your vehicle. From trailer hitches to roof boxes, we have everything you need at Bank Street Toyota. When the weather begins to change, come into Bank Street Toyota for all your winter or summer tire needs. 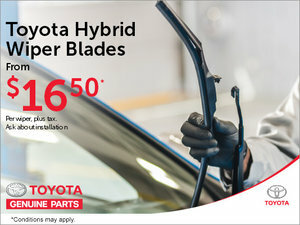 We also offer seasonal promotions that apply to a wide range of Toyota genuine parts and accessories. Moreover, if we do not have the part or accessory you need in stock, we will order it directly from Toyota and notify you when it arrives. Contact us today at 1 855 217-7044 to learn more about Toyota genuine parts and accessories or contact us online using our contact form through our website.